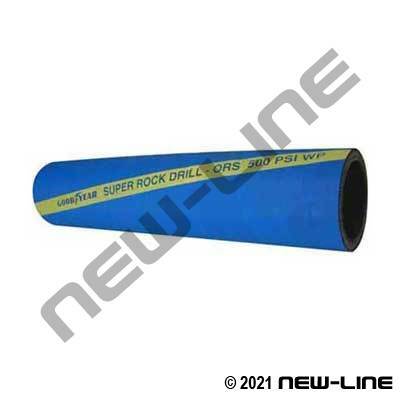 NL1090 Goodyear Super Rock Drill is an extremely heavy duty, high working pressure, wire reinforced air hose designed specifically for severe applications in oilfield, mining, construction, or industrial service. Its thick construction resists heavy abuse, abrasion, gouging, tugging, excessive oil, and very high temperatures. The special rubber compounding of this hose also gives it excellent resistance to petroleum based oil as well as vegetable oil and mineral oil. It is a quality hose that is priced between traditional, regular steel wire air hoses (i.e. NL1060) and higher end, more expensive steel reinforced hoses on the market. Typical Fittings: Boss ground joints (STEM-MALE,CAST), interlocking bolt clamps (CLAMP-4BOLT-DIX) (crimp sleeves are not recommended due to the tough cover and wall thickness - use interlocking bolt clamps only). Eaton 1A-FJ 1A-FJ permanent crimp fittings for sizes 1-1/4", 1-1/2" & 2 Only. Whipcheck Safety Cables are mandatory on heavy duty air hoses for safety reasons. Interlocking bolt clamps MUST be checked and retightened before EACH use due to the cold flow/setting characteristics of rubber hose! Construction: Tube: Black, heat-resistant Nitrile (ORS) synthetic rubber, RMA Class A (High Oil Resistance). Cover: Blue Chemivic® synthetic with spiral yellow transfer stripe (wrapped impression) MSHA approved, RMA Class B (medium oil resistance). Reinforcement: Spiral-plied steel wire.